Technology has undoubtedly changed the way we do a lot of things in life. The financial world is no different and investing is no exception. Today’s average stock trader has access to endless amounts of information and advanced training tools that the original investors couldn’t even imagine would eventually be part of our now fundamentally altered financial markets. Advances in investing technology have allowed investors to generate record values for their companies and shareholders. With the new rise of crypto currencies and artificial intelligence, there is no telling where the world of investing is set to go. But, it’s interesting to see the impact of technology trends that have changed the investing landscape through the years. Let’s take a closer look at how new technology has transformed financial markets and made way for today’s modern day investing as we know it. Here’s the top 15 technologies that have changed the world of investing. Computerized trading terminals were introduced to the investment world in the 1960s. Just think of how much our computers have changed since then. Trading terminals have rapidly advanced since that time, leading to a vast improvement on the amount of information available to traders. The original terminals were dedicated trading machines that were created by Ultronics and Scantlin Electronics. They were simple. Analysts could use basic keys to request stock quotes. Today, terminals use cloud-based software that can be uploaded on virtually any device. Investors now have an advanced network that is secure and works in real-time to deliver up-to-date pricing and market news. These systems can quickly execute trade and even chat with competitors and clients. While it might not sound like a big deal, circuit breakers were a crucial element of stable financial markets back in the day. Today, innovative milestones allow for a flashier type of technology when it comes to circuit breakers. In the stock market, circuit breakers temporarily stop trading on an exchange or security when prices become excessive. These systems are designed to control panic-selling. Today’s technologies allow trades to be automatically closed for 15 minutes if the index falls to 7% below its previous close any time before 3:25 pm. Think back to the old images of crowded trading floors in famous venues like the New York Stock Exchange. Electronic stock exchanges have changed that fast-paced buying and selling method when they were introduced in 1971. NASDAQ first launched the electronic stock market at this time, allowing traders to post bids and make offers digitally. With the ease of electronic stock exchanges, investors can do the legwork that was once done in a fast-paced, crowded room from the comfort of almost anywhere. Investors have taken more control over trades with the introduction of online trading. Where they originally had to call a broker, online trading platforms allow investors to pass by their full-service broker, and save the average 2.5% commission rate they were paying. Many smart financial advisors began to develop online platforms that could link individual investors with current stock price information to deliver direct buying and selling opportunities. The world of online trading has certainly opened up a direct connection between investors and their trades, allowing them to execute orders on their own. Speaking of online trading, smart phones have rapidly advanced the way investors can gather information and execute trades. 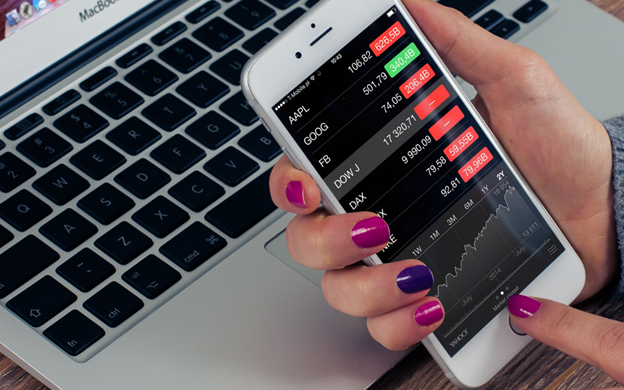 With the advanced computing power, today’s average smartphone has become a game changer for the world of investing. There are no longer any physical constraints when it comes to making a trade. There’s an app for that! Seems like there’s an app for everything these days! Personal finance and online budgeting tools have also changed the way people track their investments and personal finances. This new level of visibility delivers hands-on management to investors and their investments. Simple, user-friendly applications allow investors to benchmark their investments and manage their budget. Quick, Mint, and LearnVest are great examples. Collecting and analyzing data on a massive scale has made big data the core of regulation and management when it comes to the financial market. This data can now monitor market activity and easily catch illegal trading. Retail traders, big banks, and hedge funds all use big data for portfolio management and more. With predictive analytics, investors are realigning themselves in big ways when it comes to investing. This treasure trove of data is even beneficial to modern investors. When it comes to social media, you can track pretty much anything. This includes the impact of news on global markets. With real-time insights, investment professionals are using social media to gather assets and make trades. Buying a home is probably the biggest investment most people with make in their lives. With websites such as Zillow, Trulia, and Realtor.com, the real estate market has a new level of information access. Where buyers relied solely on realtors, newspapers, and driving around to find houses for sale years ago, 44% of home buyers find their properties online these days. From updated photos to market trends and comparable sales, home buying decisions can be nearly completed in full online. Algorithms use programmatic rules to analyze trading volume, timing, and other factors at a rapid rate. They give buyers the power to execute orders quickly and have lead to a rise in algorithmic trading. These powers are nothing short of powerful. This form of automated trading uses advanced algorithms to nearly instantly execute trades. While not everyone is dominated by high frequency traders, nearly 52% of daily trading volume is represented by HFT. Although crowdfunding started recently, emerging in the late 1990s and early 2000s, it has been a great way for artists to raise money for their creative projects. Equity crowdfunding allows accredited investors to meet certain financials standards to buy shares of early company concepts through approved marketplaces. Also called P2P, peer-to-peer lending allows individual investors to loan money to individual borrowers through streamlined marketplaces. Instead of equity returns, they receive interest for unsecured loans. One of the biggest financial stories of 2017 is cryptocurrencies. These digital currencies use cryptography to provide an anonymous and secure payment system. The technology blockchain is used for these systems. It is a network of distributed digital ledgers that post and verify transactions to prevent fraud. Wall Street is currently big on artificial intelligence. With many financial firms turning to computer algorithms to gain a competitive edge, AI allows financial institutions to bring investing to the next level. Today’s financial institutions use AI to analyze voice patterns of recorded calls at investment banks, identify fraud, recognize trading patterns, and more!